In2Events have worked with Exertis Unlimited; a distributor of technology products for the B2B, mobile and retail markets, for a number of years, supporting them on a range of projects across exhibitions, events & corporate incentives. Via our on-going relationship with Exertis Unlimited and following their acquisition in Nov 2016 of ‘Medium Ltd’; a specialist AV distributor in the UK, In2Events were more recently introduced to the Head of Marketing for the Exertis Medium division and began working with them on a series of opportunities - the first of which was on behalf of one of their vendors, AV specialist C-Touch, covering their presence at The BETT Show in January 2018. Exertis Medium has an unrivalled reputation for customer service, industry knowledge, specialist support services and solutions in key areas of the AV market; as such they act as an extended marketing function within the distribution market for the C-Touch brand, aligning their technical expertise and marketing knowledge towards the relevant industry channels and where C-Touch products may compliment these markets. The Head of Marketing for Exertis Medium stated that he “wanted to work with In2Events from the first time I met them”, hitting it off with the team straight away he felt we were the kind of agency that Exertis Medium could work well with across a wide spectrum of projects; particularly when we were able to demonstrate that we knew and understood their business, their target market and their customers. It also helped that we already had established relationships within the Exertis Unlimited network and had been internally referred by a colleague who has had plenty of experience of working with us over the years, so gave us a glowing referral! Alongside this, we have a vast experience of working at BETT and have worked with between 4-6 clients on their large scale stand builds at the show for the last 5 years, meaning that we understood the client’s brief and education market appropriate to BETT, “the fact you came up with a great design was a bonus”. 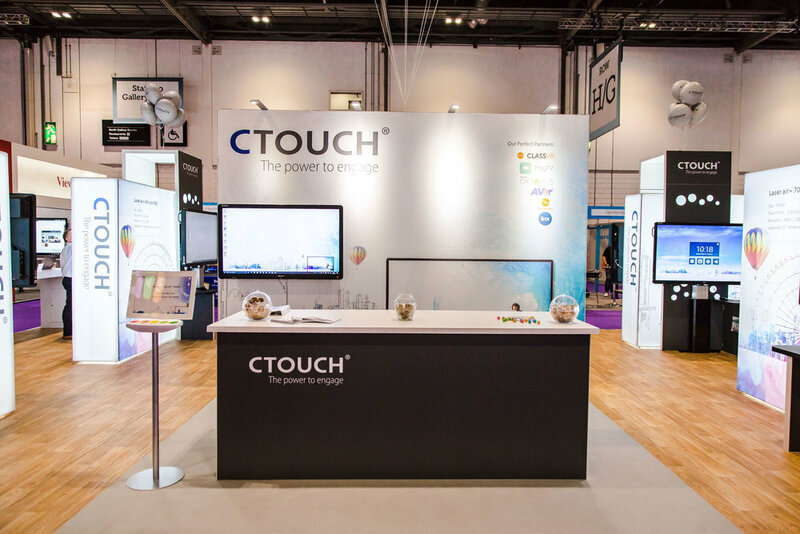 The objectives of the stand design were to showcase C-Touch products, covering a range of touch-screens at various scales, alongside their complimentary & integrator apparatus such as visualisers, laptops, tablets and VR technology. The screens needed to speak for themselves whilst being easy for delegates to access and interact with, as well as for C-Touch & Exertis Medium staff to be able to professionally demonstrate the use of the products to a small audience in context of the education market. C-Touch had recently refreshed their brand identity which meant we had some great new artwork assets to work with. We proposed a design which was relatively simplistic, though very effective in regards to form and function, aimed at keeping the stand open and inviting with clean sight lines and finishes. This was underpinned by successfully drawing attention to the products as the main focal point, in a way that really showcased them in a sophisticated and sleek fashion - we did this through the use of a series of lightboxes overlaid with the C-Touch artwork, which lent itself particularly well to this application. There was an open meeting area at the back of the stand, intended as a dual function space to accommodate informal meetings and demonstration of the largest of the touch-screens, alongside the VR technology. 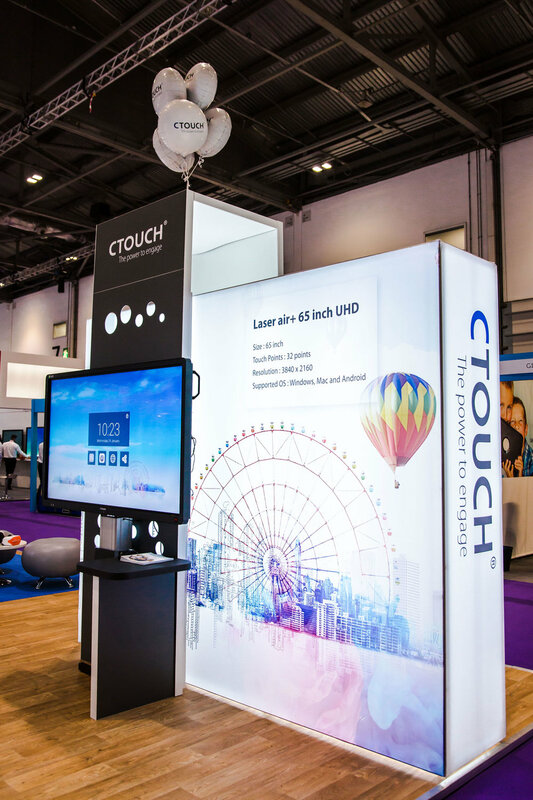 In all, there were ten large scale screens showcased across the stand, with a product and branding laid out in the direction of every approach so that delegates couldn’t miss C-Touch at the show; this was finished off with a huge C-Touch hot-air-balloon fixed to the top of the stand, providing high-level branding in such a way that the stand could be seen from right across the floor of the show.